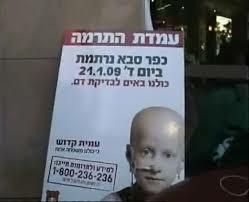 If Amit’s face looks familiar, it is because Amit was the poster child in the huge campaign organized by Ezer Mizion to stimulate an influx of new bone marrow registrants. That da y 64,000 (!) samples were collected to be genetically tested. Countless families, including Amit’s, held their collective breath, praying that one of the new registrants would be a perfect DNA match for their loved one. Thanks to those samples, more than a hundred life-saving bone marrow transplants have taken place. 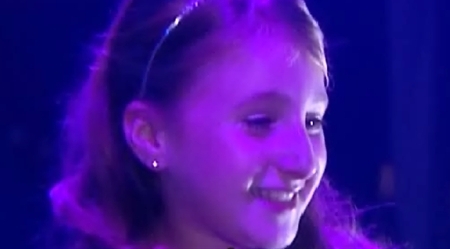 Amit’s Bat Mitzvah was celebrated together with hundreds of guests, including medical staff who had cared for her during her illness. Everyone smothered her with hugs and kisses and cheered for their heroine. Turning to the large crowd, Yuval said, “When we set out on the campaign to save Amit’s life, we chose the slogan, ‘We are all one family!’ Every day we got to know more new ‘family members,’ good-hearted people who were ready to turn over worlds to help and support us and bring Amit to recovery. If it were up to me, I would invite to this celebration all 64,000 people who stood on line to donate samples the day of Ezer Mizion’s campaign, all 18,000 soldiers who donated at the various army bases, all 13,000 volunteers who put the unprecedented campaign together, all the hundreds of thousands of people who donated a total of 14 million NIS so that the samples could be processed, vastly enlarging the bone marrow registry plus all those people who didn’t forget us when we went to the U.S. and sent us packages with goodies and encouraging letters. I want to tell all you wonderful people today a huge thank you. This feeling of brotherhood is unique to our people.